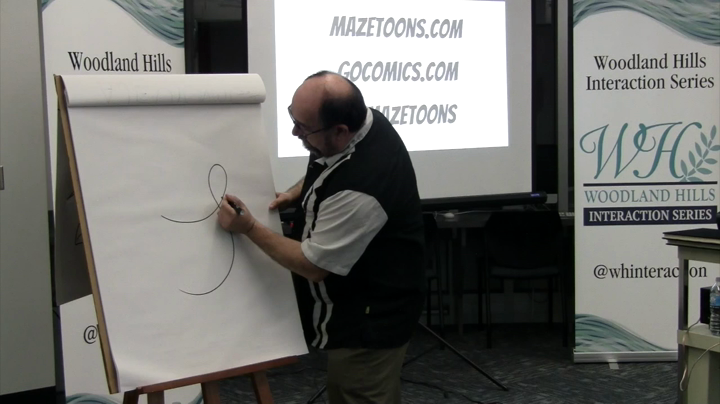 On Wednesday, February 21, the Woodland Hills Interaction Series hosted professional cartoonist Joe Wos. Mr. Wos shared his experiences working as an artist with a group of art students. He is a graduate of the first graduating class of Woodland Hills High School, the class of 1988. Since the age of fourteen, Mr. Wos has worked as a professional cartoonist and his work has been displayed in museums around the world. He created the world’s largest hand-drawn maze, measuring 140 square feet. Mr. Wos has published several books of mazes and regularly publishes his mazes and cartoons on his website, MazeToons. During our first five years, the WHIS has hosted such notable guests as Jennifer Egan (Pulitzer Prize Winner), Colum McCann (National Book Award Winner/Academy Award nominated writer), Elizabeth Strout (Pulitzer Prize Winner), Dr. Sheri Fink (Pulitzer Prize Winner), Terrance Hayes (National Book Award winner/MacArthur Fellow), Jesse Andrews (N.Y. Times Bestseller), Dr. Cyril Wecht, S.L. Price (Sports Illustrated Senior Writer), and Robert Bilheimer (Academy Award nominated director). Additionally, the WHIS has also hosted local writer Dave Newman, poet Jim Daniels, EPA Director Barnes Johnson and U.S. Ambassador Bryant Salter.